I’m not a person that writes stuff down with pen and paper, but sometimes there’s a glimpse of tradidional writing tools that catches your eye and makes you want to toss away everything digital and lock yourself in a shed on the mountains to handwrite your life novel. Yes, you’re actually watching ink dry here. But this is no ordinary ink, just look at how satisfying the color changes once it’s on the paper. This is the ink for expressing true penmanship skills. 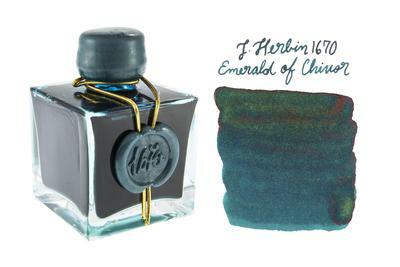 blockquote>This J. Herbin ‘Emerald of Chivor’ blue ink contains a red sheen with gold flecks throughout, enhancing your writing with an elegance and beauty that is unmatched by other inks. Each 50ml bottle is hand dipped in sealing wax with a stamped “1670” seal on the front and individually packaged in a collector edition box. The paper in this gif is equally satisfying. This is textured paper from Canson for watercolor and ink.